Mom's Musings: Madagascar 3 and Kinder Surprise!! 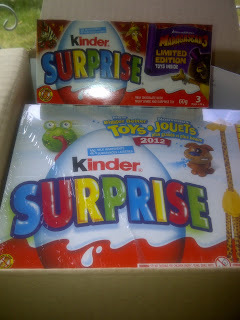 Madagascar 3 and Kinder Surprise!! BUT...Kinder ALWAYS has amazing contests over there, so you need (yes NEED) to go and "LIKE" the KINDER CANADA page so you can keep up to date on what's going on!! AND even though I told my kids NOT to eat the special Madagascar 3 ones, so I could get a special picture of the toys, they did...Cause my kids LOVE Kinder SOOOOO much!! I have loved watching my kids put these toys together, when they haven't snuck them, and even Faith, who has a developmental delay, was able to find some toys in there that she could put together or play with! I love that!! Have you seen the movie yet? If so, what did you think of it? Have you checked out the Madagascar 3 Kinder Eggs? Who in your house loves Kinder Surprise the most?